The 10 Most Unique Hotels in Oklahoma! Whether you’re just driving through Oklahoma, or you want a weekend trip that’s a little bit special, there’s plenty of unique places to stay. You’ll find luxurious, historic hotels that have hosted presidents and movie stars and interesting places with themed rooms and accommodations you won’t find anywhere else. Here are our 10 favorite unique hotels in Oklahoma. For over a century, the Skirvin has provided some of the finest lodging in the heart of downtown Oklahoma City. The hotel played host to dignitaries like Harry Truman, Frank Sinatra and Bob Hope. In 1988, the doors closed for 19 years, until it was renovated to regain its former glory. Frank Lloyd Wright designed this skyscraper, his only one. You have the opportunity to stay on one of the top floors of the building in a luxurious room that overlooks the city. It’s a National Historic Landmark with a nonprofit art museum on the first two floors. The original hotel was built in 1906, but a fire destroyed the building in 1962. John Wayne and Roy Rogers were just two of its most notable guests. The Chickasaw Nation rebuilt the hotel to its former glory and reopened in 2013 with all the amenities and luxuriousness of the first Artesian, but with all the comforts modern travelers expect. Step back in time to the 1950s when poodle skirts and greasers were the rage. Each room has a theme, such as Elvis, Marilyn Monroe, John Wayne or Lucy and Desi. Enjoy a free continental breakfast in the hotel, or walk to Angie’s Diner for heftier fare. Behind the hotel is a full entertainment center with bowling, an arcade and miniature golf. Rebel Hill features several different cabins designed for luxury and comfort, but it’s most unique room is a refurbished passenger train car that was built in 1911. It sleeps six and has two bathrooms, one with a claw-footed tub. All the furniture is designed to provide a Victorian style weekend. While you’re at the ranch, enjoy horseback riding, bird watching, hiking and more. Stay in a climate-controlled yurt with full bedrooms, bathrooms and kitchenettes, right on the river. These round buildings are cozy and sleep more people than you can imagine. Facilities offer outside fire rings where you can enjoy s’mores and a campfire in the evening. 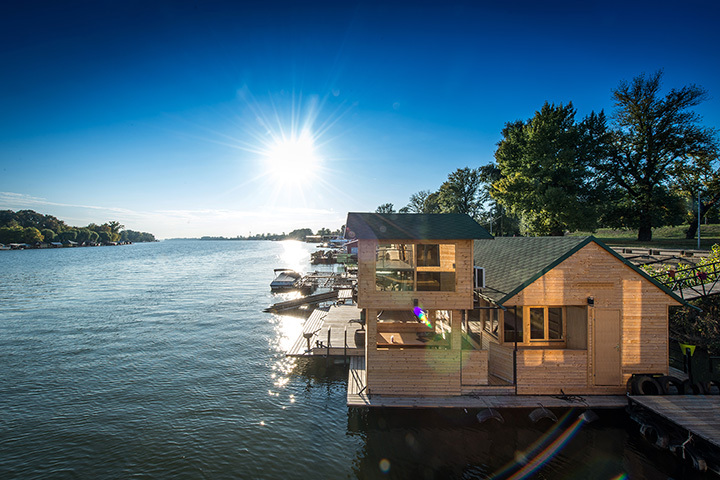 If you’ve ever wanted to try a houseboat, check out the floating cabins on Lake Murray. Each cabin has full amenities, including a kitchenette and full bathroom. Step out on the deck to enjoy the scenery of the lake. An indoor campout experience to enjoy sleeping in a tent without the bugs and noises of the outdoors. Come enjoy a three-hour campout or stay overnight with all your friends to make special memories. These cabins in the woods may appear rustic at first glance, but inside each cabin offers all the luxuries you could imagine. Many of the cabins are pet-friendly. Some have outdoor hot tubs and frills. Many feature indoor and outdoor fireplaces. Oak Trails is the largest family, clothing optional resort in Oklahoma and one of the largest in the United States. It has beautiful facilities within the 400 acres of land. Enjoy nature trails, heated pools and a hot tub in the buff.